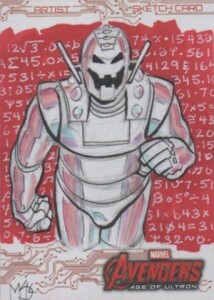 2015 Upper Deck Avengers: Age of Ultron trading cards take a look at the blockbuster sequel. Besides an in-depth look at the film itself, the product has plenty of extras including actor autographs and memorabilia cards. The base set has 90 cards. It looks at Captain America, Iron Man, Hulk, Thor and company take on Ultron, the ultimate in evil robots. 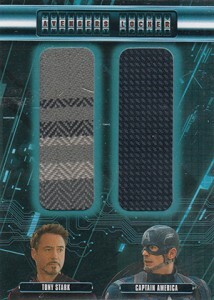 The base set also has multiple sets of parallels including some that are hobby exclusives. 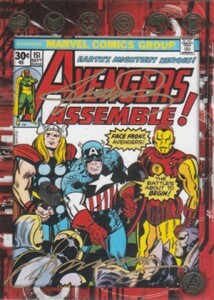 One of the things that Upper Deck has done well with most of the Marvel movie sets is landing many big-name autographs. No names have been released yet, but Age of Autographs have signatures from the likes of Chris Hemsworth (Thor), Jeremy Renner (Hawkeye), Cobie Smulders (Maria Hill) and Thomas Kretschmann (Baron Strucker). Besides single autographs, there are dual and triple autographs and autographed memorabilia cards. Signed Comic Covers cards come autographed by comic creators. 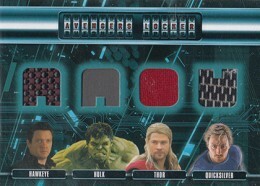 2015 Upper Deck Avengers: Age of Ultron also has movie memorabilia cards in the form of Avengers' Locker. These have up to four swatches of material. Another insert set connects together to spell "Avengers." Basic inserts include Behind the Lens and Concept Series. These explore how the movie came together. The following is a list of the artists who contributed to the set. 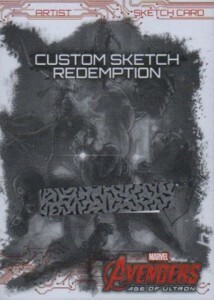 There are also redemptions for custom sketch cards. Really excited about this set! Have any other details about the configuration been released? Any checklist available? I bought a couple 31 card packs at Target today. Stumbled on them by surprise. Got a sketch card, and they come with ‘exclusive’ 3D hologram cards. I’ll look and see if I got a checklist. Jodie � If you go to the checklist, there is a link to eBay listings for complete sets. For a movie that has so many great actors the autographs in the set is disappointing. Was hoping RDJ and Scarlett Johansson would have had signed. 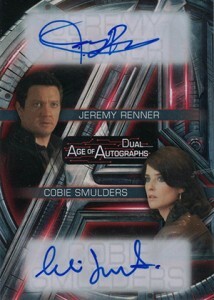 Nothing against Cobie but she’s been in tons of Marvel products already. 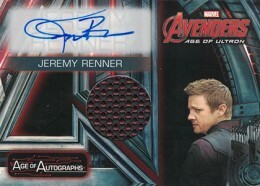 Hemsworth and Renner have signed in other sets also. Do you know how likely getting an autograph in this product is? Mike � They’re tough. I’ve heard an average of two per hobby case. Don’t think any are in retail. dadou69 � The print run for each parallel is listed in the checklist tab. Silver Foil (not numbered), Blue Foil #/199, Patterned Foil #/10, Printing Plates 1/1. hello so there are 90 map blue foil / sliver foil cards 90 / 90 Card partened ???? dadou69 � They are parallels of the base set, which has 90 cards. So there are 90 different cards of each for Silver Foil, Blue Foil and Patterned Foil. Blue Foil only has 199 copies for each card and Patterned Foil only has ten.